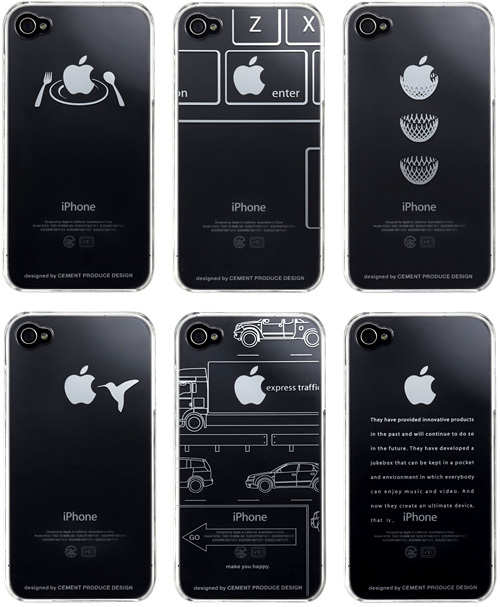 iPhone 4 iTattoo Snap Case Plays It Up With The Apple Logo | OhGizmo! By Andrew Liszewski on 09/20/11 • Leave a comment! Etsy is a gold mine of MacBook decals that play around with the glowing Apple logo on the back of the display. But for some reason the Apple logo on the back of the iPhone doesn’t get nearly as much love. iTattoo’s snap case for the iPhone 4 starts to fill this vast void with 6 designs that, quite frankly, aren’t that clever. I realize they can’t use copyrighted characters like Iron Man or Snow White, but a single hummingbird? Really? That’s one of the top 6 designs you put into production? Each case is made from clear polycarbonate so it at least won’t take too much away from the iPhone’s design aesthetics, but at $48 (€35) a pop they should have brought more to the table than a knife, fork and plate.